The Hudson house, seen in 1962 horror classic "WHATEVER HAPPENED TO BABY JANE?" (starring Bette Davis & Joan Crawford), still stands in the upscale Hancock Park neighborhood of Los Angeles. And it still looks very much like it did in the movie. You'll find it at 172 S. McCadden Place, just north of 2nd Street, about a mile east of FarmersMarket. The Victorian home seen in the original 1968 version of "YOURS, MINE & OURS" (starring Lucille Ball & Henry Fonda) is still around, and in fine shape. Built in 1893, in real life it's known as the Blankenhorn-Lamphear house. 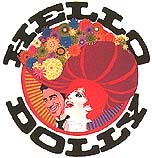 In the 1969 musical "HELLO DOLLY," matchmaker Barbra Streisand teaches a young Michael Crawford ("Phantom of the Opera") how to dance, in a park filled with fountains. One of the large fountains seen in that "When You're Dancing" scene can now be found at an unlikely spot: an amusement park. The fountain was also seen in the background of the "It Only Takes a Moment" duet in the park. This fountain is now called the"Charleston Circle Fountain," and it's located at the entrance to the Roaring 20's area of Knott's Berry Farm (at 8039 Beach Blvd. in Buena Park), the nation's oldest theme park, located a few miles northwest of Disneyland. Both the 1965 film "INSIDE DAISY CLOVER" (starring Natalie Wood and Robert Redford) and 1969's "THEY SHOOT HORSES, DON'T THEY?," starring Jane Fonda, were shot at the carousel on the historic Santa Monica Pier, located at the west end of Colorado Avenue.